Nanaksar was founded by an ascetic Baba Nand Singh ji [died-1943]. The sect doesn't subscribe to natural path sahij marg of Guru Nanak where ritualism and penance is prohibited. They worship Guru Granth sahib like an idol and their other religious activities are more like Hindus. Their total commitment to Gurbani is however laudable. At one time the Government was promoting this sect. We are surprised to note in past the Govt. at Delhi had allowed them to build a Gurdwara at a prime land in a park, green belt at Shankar Road, near Rajinder Nagar, while at the same time it had simultaneously demolished some structures at Majnu ka Tilla Delhi a historic site on the banks of river Yamuna. We have recently visited Nanaksar (near Jagraon Ludhiana) to know more about them. • Guru Granth is installed like an idol and access to an ordinary devotee is denied to it. • . The Sikh flag nishan sahib is not hoisted on the building. • A, separate term is assigned to the Gurdwara i.e Thath or the abode of enjoyment..
• . Sikhism condemns renunciation of family life, they have founded a group called Behangams the ascetics who are to remain unmarried throughout their lives. • . They specifically prohibit meat eating. • . They don't read Raj karega Khalsa couplet ordered by the Tenth Guru. • . They do wear five Ks of the Sikhs, with a small sword of merely of an inch or two like a janeo of the Hindus. • They don't believe in the free kitchen langar concept of Guru Nanak. • . They don't subscribe to the concept of Sangat and instead give importance to individual saints. • They do not subscribe to the Gurdwara practices of til-phul i.e humble offering according to ones means instead they separately or say secretly accept money. • They don't subscribe to the traditional Prasad system of the Gurdwara and rather they accept sugar cubes from devotees which are clandestinely sold back to . the shops nearby. • . They observe auspicious/inauspicious days and dates. At present there are two groups controlling the Thath here at Jagraon- one lead by Baba Kundan Singh and the other by Baba Sadhu Singh. We have found the group of Baba Kundan Singh more ritualistic than the other. At the time of our visit Baba Kundan Singh was not available, we talked to Baba Sadhu Singh. Q- Why you are opposing-Nanakshahi Jantri? BSS- Sikhs are celebrating festivels relating to Gurus for 500 years . How can we change the days now. Q- But the Bikrami calendar doesnot confirm to seasons.? 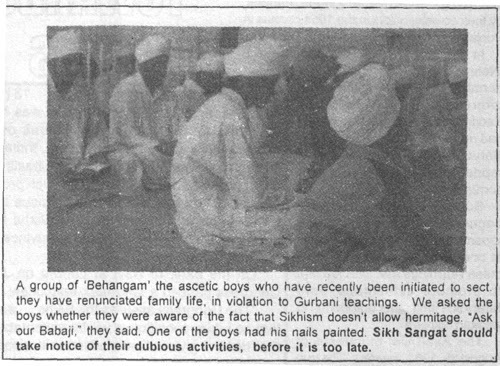 Q- Who are these ascetic boys Guru Nanak condemns renunciation. BSS- Were panj pyaras the five beloved married? BSS- Because we don't have langar the free kitchen here, what ever God sends we just accept it. Q- We have seen some booklets [Gutkas] published by Nanaksar wherein changes have been made in Gurbani. Sikhs apprehend that it a beginning to make attempt to alter Gurbani. Also in these Gutkas a long commentary is published in the beginning of some Sukhmani gutkas wherein impression is being given that Guru sahiban were sick and suffered from leprosy which is historically incorrect? BSS- Ask from those who are doing it. (Babaji hints at the other group namely the followers of Baba Kundan Singh) . Q- The code of conduct [Rehatmaryada] you observe is not essentially the Sikh one? BSS- We follow Hazur sahib Marvada. Q- But at Hazur sahib they serve even meat in langar which you prohibit? BSS- They may do any thing. We are not to stay there. Q- When a Sikh goes before his Guru he makes humble offerings (till-phull) there. You 'have stopped this practice and on the contrary accept money separately and rather secretly. Q- Guru Nanak condemned ritualism especially show through dress i.e bhekh? BSS- Guru had founded the nirmal panth. lf some one wears white or red how does it bother you? Q- So politics should be separated from religion? BSS- Get out from here. Go.